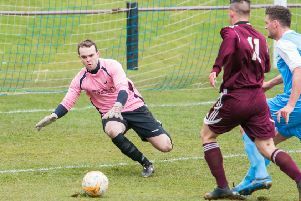 The club already knew its fate before Saturday’s 1-1 draw with Gala Fairydean Rovers as the gap between themselves and Dalbeattie Star was insurmountable following their 2-2 draw with Spartans last Wednesday. The visitors led courtesy of Phil Addison’s deflected effort on the half hour mark before Mikey Hamilton headed home Kevin Keane’s corner to ensure a share of the spoils. Whitehill, 12 points adrift, have two league games remaining with Edusport Academy the visitors to Ferguson Park this weekend before a final fixture away to Edinburgh University. It has been a turbulent year for the Midlothian outfit both on and off the park, with just a solitary league victory all season and three different managers in charge. They will be demoted to the new revamped 16-team East of Scotland League along with possibly Penicuik Athletic, Bonnyrigg Rose, Newtongrange Star and Dalkeith Thistle. Bonnyrigg have guaranteed themselves a play-off place, while Cuikie will be hoping to join them, to battle it out for a place in the Lowland League. Whitehill’s problems began when they axed Gary Small after just two games into the new season following a 6-0 defeat to Kelty Hearts. Jock Landells, his successor, was in charge for all of two months before the Rosewell outfit were against searching for a new manager. Former Berwick Rangers coach Ian Little then came in and attempted to steady the ship but was unable to steer the club to safety despite an improvement in performances.